Can you believe fall is finally here? It seems like we have been waiting forever! To kick off our Fall Style Blog Tour 2017, I decided to experiment with the “athletic” trend that continues to be popular this season. We are pretty casual here in the Pacific Northwest and I normally live in knits and jeans so this seems like a good fit for me and my lifestyle. 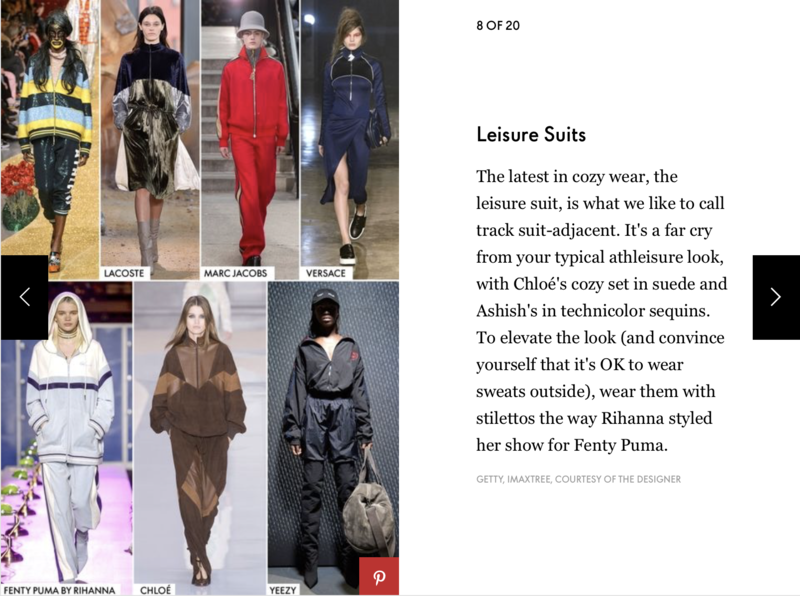 Leisure suits, joggers, sweatshirts, hoodies and puff coats—all great pieces! The release of Named’s FW17 collection sealed the deal! 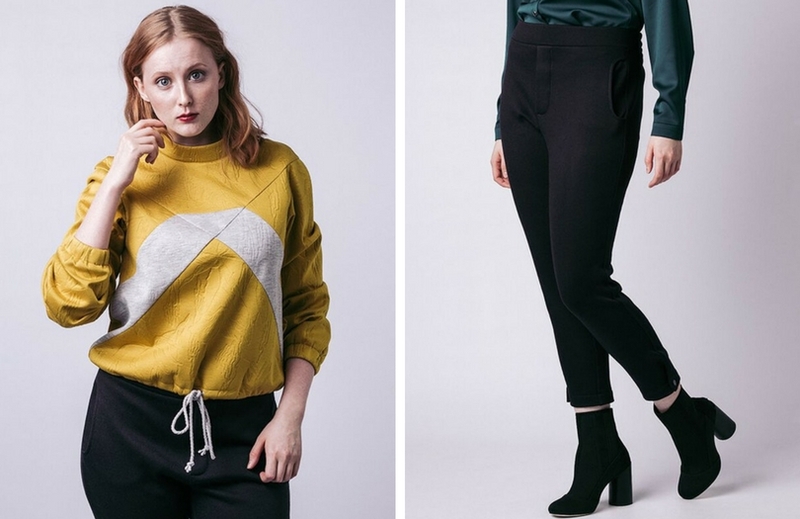 I immediately fell in love with their Gemma sweater and Ruri sweatpants. Sophisticated but comfortable, these patterns help elevate what could be overly casual into something that is more unique and dare I say stylish. Now for the hard/fun part… picking the right fabrics. 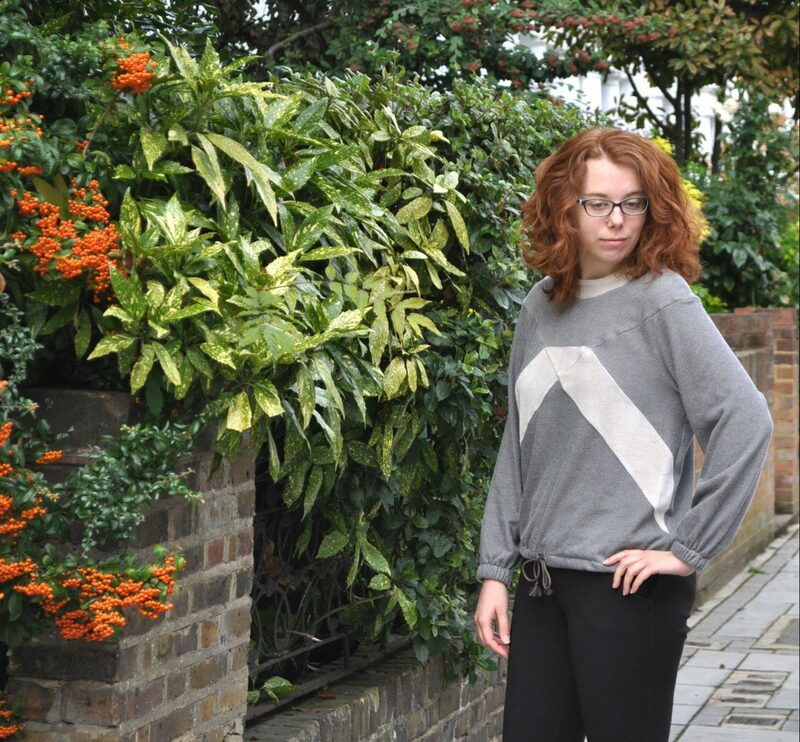 For Gemma, the pattern calls for medium to heavy weight knits that can be color blocked or reversed for the geometric detail at the front. 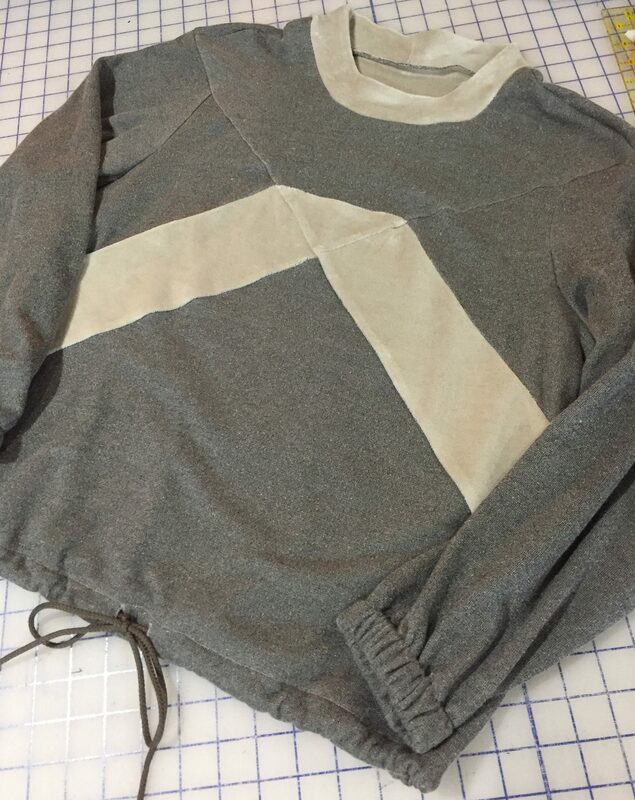 After looking at a few French terrys and sweatshirt fleeces, I settled on a stretch velour in a really pretty heathered taupe with a cream reverse. I’m loving the darker neutral tones! Ruri suggests a mid-weight sweatshirt fleece but I think any medium weight, thicker knit would do. Since I was going for a little less casual look, I laid out several different ponte knits but couldn’t settle on the right one. 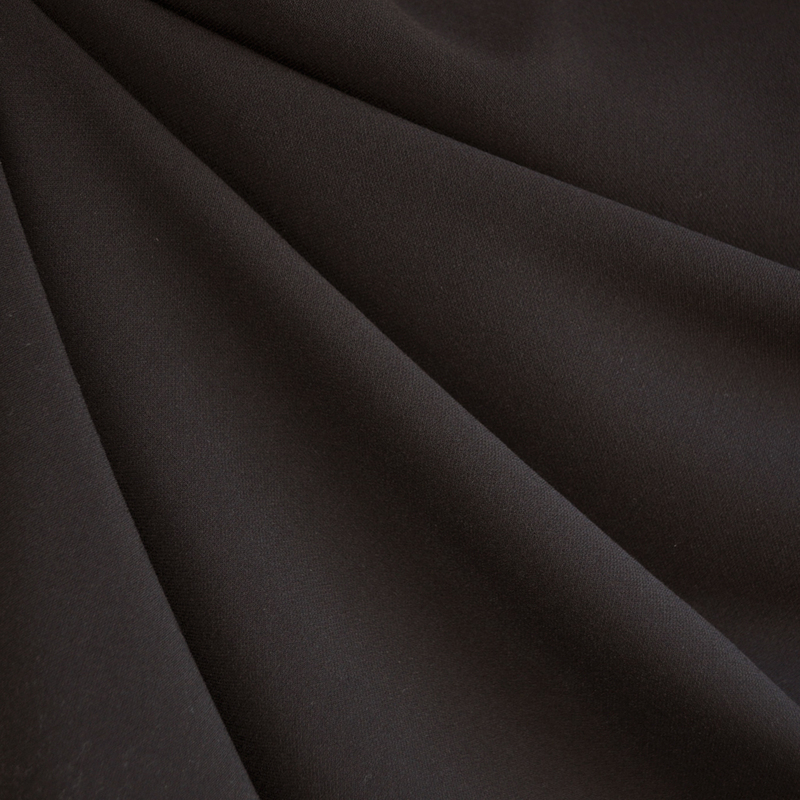 In the end I made kind of an unconventional choice, I picked out a stretch double twill (aka tricotine) in a deep espresso brown. Not only does it have a great weight and stretch for these pants but it is also the perfect color to pair with the velour! With the fabric and patterns selected, time to get sewing! I sewed up both of these pieces over a weekend and only made a couple of slight changes. Based on the sizing I selected a size 8 (my normal size for Named patterns), but decided to lengthen both garments a bit. I am 5′ 9″ and tend to like things on the longer side, so I always look at the finished garment measurements to check the length or inseam. 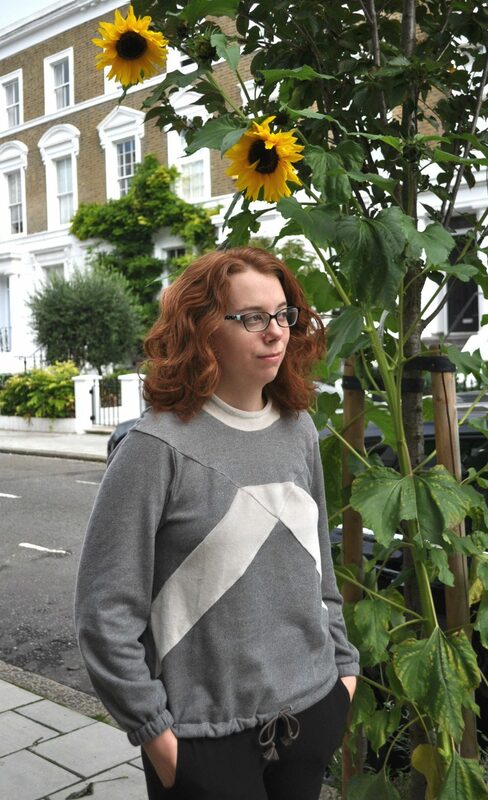 For the Gemma sweater I added 2″ close to the hem so I didn’t alter the piecing details. And on the Ruri I again added 2″, this time lengthening at the knee. Actually sewing the Gemma was a lot of fun! It is like a sewing puzzle that you aren’t quite sure how it is going to go together. Named does a great job with the instruction, just be sure to follow them, especially when it comes to which way to press the seam allowance! The sequence in which the pieces go together is perfectly planned and interlock perfectly. 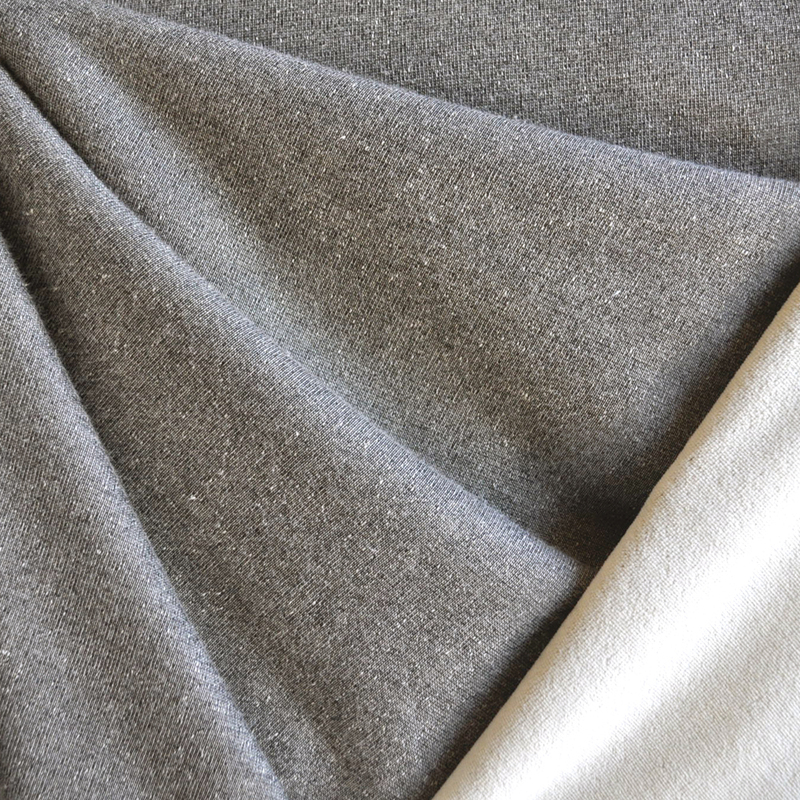 The velour fabric I picked sewed together beautifully and was not difficult to work with at all. Probably the biggest thing to watch for is the direction of the nap on the wrong side. It doesn’t matter so much when it is on the inside but on the pieces that are visible you want to make sure you have them going all the same direction, in my case that was downward. 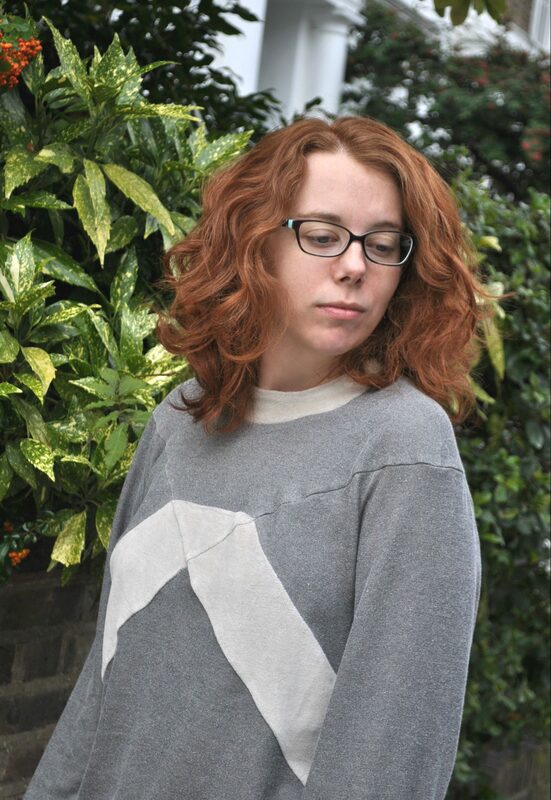 One last minute change I made was flipping the funnel neck so that it matched the geometric accent. I like the additional cream contrast and the extra softness around my neck. I also didn’t have grommets for the drawstring at the hem so I made due with button holes. Not a big change but I thought I would mention it in case you don’t have grommets on hand either. I don’t have much to note on sewing the Ruri pants together. The process was straightforward and rather simple as well. I love the faux fly front and the partial elastic waistband. And those snaps at the bottom cuffs are spot on! The only change I made was since I used more of a woven fabric, I did serge the hem before stitching it in place just to prevent any raveling. In the future I might also figure out making the pocket bags slightly larger so that I can catch them in the waistband seam just to secure them in place. I love how this outfit turned out—the perfect combination of sporty and sophisticated and the velour sweatshirt is so cozy! Not only would I feel comfortable wearing this out-and-about, I think it would also be work appropriate. Both garments fit great and I am definitely glad I lengthened both of them. 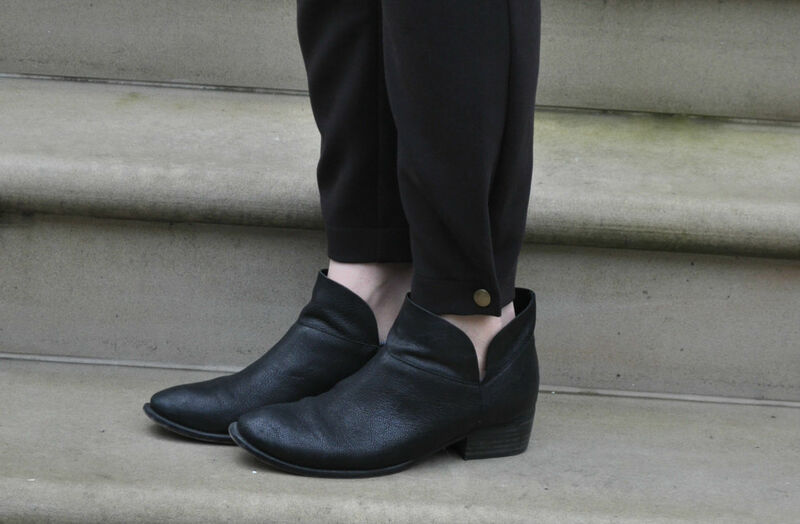 The Ruri pants are technically designed to be more of a cropped length but I think I am liking this ankle length a bit better—perfect to pair with booties! I can definitely see myself making more versions of both these garments. 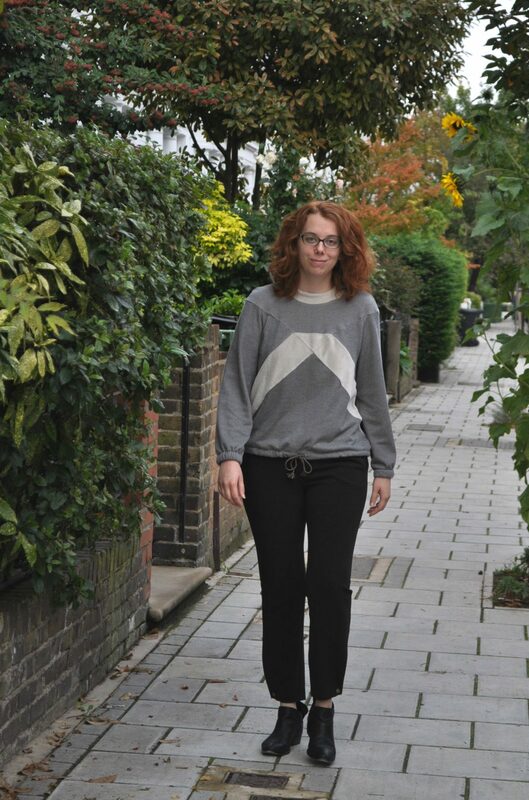 I’d love to try the Ruri pants in a sweatshirt fleece as recommended just to see how cozy they really are! And on the Gemma I think a color blocked version would be fun or one in all the same fabric with top stitching to accent the piecing. What do you think? Any other amazing ideas/interpretations? That wraps up Day 1 of our Fall Style Blog Tour 2017. Join us again tomorrow for Day 2 over on the Chalk and Notch blog. 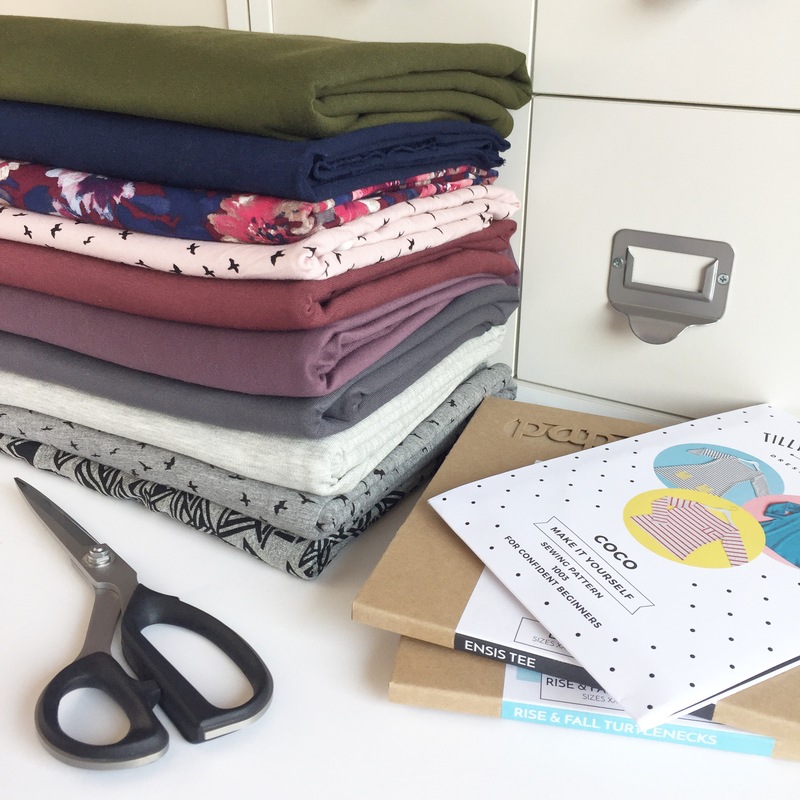 We can’t wait to see what Gabriela sewed up—she picked out some pretty amazing fabrics! P.S. Learn more about our fall fabric collection and get the full tour schedule HERE. I’ve been lusting after those pant, now it must happen! They look amazing on you. Thanks for the post. Perfect for fall in the PNW. I love this outfit so much! I live up in Bham, and I feel like this would for almost any situation. Just ordered my swatches yesterday! This looks amazing! I love the sweater in those fabrics.